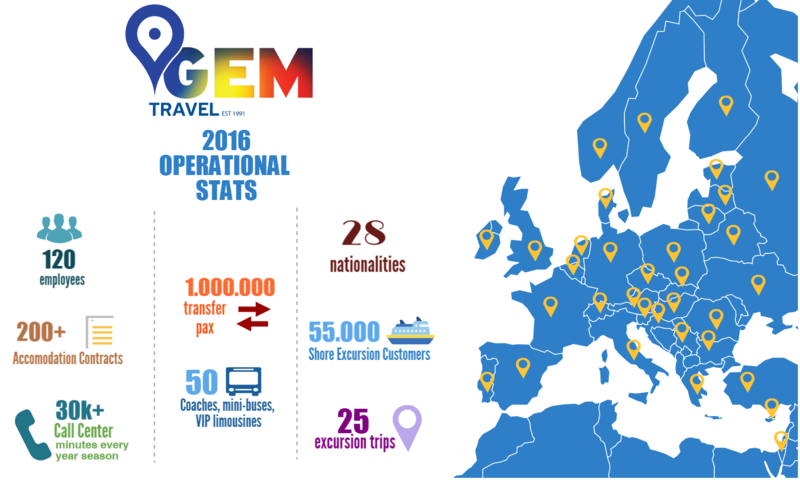 About GEM Travel | Tourism Agents in Rhodes and Kos. “Creating authentic and unforgettable travel experiences"
GEM Travel was founded by Mr George Michalakis in Rhodes in 1991, as an incoming tourism agent. Since then, our company is enjoying a dynamic growth every year, regarding the number of the passengers and the markets that we provide our services. The knowledge and the professionalism of the owner and his team, has developed long term partnerships with tour operators from 28 markets. Since 2014, GEM Travel is also operating in Kos Island, offering a full package of tourism services such as hotels, transfers and excursions. During the last years, our company has evolved to one of the biggest Destination Management Companies on the islands of Rhodes and Kos. Our value is to achieve total client satisfaction, by creating unique tourism icons and experiences based on the quality, the value and the differentiation of our services. To achieve strong and long term partnerships with tour operators around the world, by sharing our 26 years experience, knowledge and professionalism. We aim in becoming the leading Destination Management Company on Rhodes and Kos islands, providing all possible tourism services, while focusing on the highest quality and the best value for money relationship. The main office of Gem Travel is in Rhodes. We are operating with our own offices in Kos Island and we have a strong network of partnerships round all Greek Islands.